Issues relating to the environment, though not on top of the agenda, did make their presence felt in the just-concluded assembly elections. IN INDIA, environment is hardly an election topic. No one expects political parties to make environment a plank and neither do most voters base their decisions on ecological promises. However, in the just-concluded assembly elections in Uttar Pradesh, Madhya Pradesh, Himachal Pradesh, Rajasthan and Delhi, the absence of a burning issue such as Bofors or Ayodhya brought local issues, including environment, into sharper focus. Behind all the hype and focus on routine election-related issues, environment did get talked about. Environmental issues, regardless of how localised they might have been, emerged despite being dismissed as a "non issue". Union water resources minister V C Shukla told Down To Earth, "I am a naturalist myself, but environment is not yet a concern of political parties as it does not excite the imagination of the public." He holds lack of environmental awareness at the grassroot level responsible for political inaction. But Shukla was wrong. In Pipariya constituency in Madhya Pradesh, the neglect by mainstream political parties of the issue of tribals' rights to forests led them to field their own candidate. Slogans like Jungle hamara apna hai, nahi kisike baap ka hai (The forests are ours, nobody else's), resounded during campaigning. Similarly, Union laws on forest conservation were attacked sharply for blocking development. There was a strong reaction against state-sponsored conservation in the campaign in the UP hills. Says Lalit Pande, Uttarakhand Seva Nidhi secretary, "The requirement of clearances under the Forest Conservation Act (FCA) have delayed the construction of roads, bridges and school buildings and deprived the people of access to fuel and fodder from the forests." Uttarakhand Kranti Dal candidate Vipin Tripathi in Kumaon even called for cutting down trees to symbolise defiance against the FCA. Even Satyendra Batwal, president of the Congress unit in Badri Kedar constituency, said, "If I have 5,000 trees on my forest land, can't I cut even one without getting permission from the government? Such Draconian laws have to be changed." It was clear political parties could not quite ignore environmental concerns. In fact, in some places they even hoped to cash in on it. However, none of the parties had an environmental agenda that was linked with development. And, despite flaunting environmental issues in their manifestoes, it was apparent they lacked a holistic approach to deal with environment issues and the will to allow self-management of natural resources (see box). Varing positions Party positions also varied from state to state. For instance, in the Capital, the Bharatiya Janata Party (BJP) targeted the Congress government "for allowing Delhi to grow as a mismanaged city." However, in Uttar Pradesh, the BJP ignored environment completely. Explained an embarrassed former party MLA Lalji Tandon, "It was an oversight." If political parties unite on an environmental issue, there are equal chances of it either being sidelined entirely or making a dent. For instance, in Rajasthan, the Aravalli mining issue found no place in the elections even though it was a hot topic till just a few months ago. Reason: Both the BJP and the Congress are committed fully to protecting mining interests. But in Uttarakhand, widespread support for a different resource management agenda forced all political parties to shed their ambivalence on the issue. The Mulayam Singh Yadav-led Samajwadi Party, an ardent champion of the cause, said the rich mineral and forest resources of the region are being "tragically wasted" as part of the general neglect of hill districts. Though social movements of women, tribals, low-castes, farmers, minorities and development crises brought new themes into the elections, there was confusion in distinguishing between environment and development issues. The subtle distinction between the environmental and developmental objectives of drinking water and sanitation programmes, for instance, is not clear in the minds of most candidates and voters. Says O P Sharda, president of a posh south Delhi residents' association, "There is nothing new about promising safe drinking water and sanitation. This is development and not environment." A similar view was expressed by Chaudhry Bharat Singh, the Congress candidate from Nangloi in west Delhi. Says A K Roy of the World Wide Fund for Nature -- India (WWF), "Environment comes into sharper focus when voters ask candidates whether water shortages can be solved by equitable distribution or by increasing its supply." Laments Vinod Raina of Ekalavya, an NGO in MP, "The issue of alternative development -- reconciling the issues of development and environment -- has not found clear-cut party support yet." 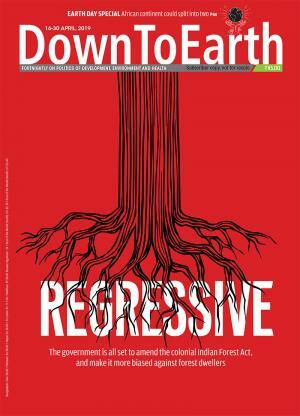 Diagnosing the electorate's apathy to the Aravalli issue, Jaipur-based environmentalist John Singh, who contested the previous election, says, "The Aravallis are no longer an important source of sustenance for the people. There are other means of livelihood such as mining, agriculture and the textile industry. Popular feeling can be whipped up only when the people are economically entirely dependent on natural resources such as the forest in the hilly region." The main players of the environment card in the elections were the NGOs. Realising most people do not understand the connection between development and environment, a group of Delhi NGOs, including Kalpavriksh and WWF, issued an environmental agenda in the form of a series of questions for voters to ask candidates to ensure accountability and the right approach to alternative development. Environmental action groups made a conscious attempt to build popular coalitions around the environment so that politicians would take responsibility for environmental degradation. The national alliance of NGOs, which was formed last year, met just before the elections to work out a plan of action to link the environment campaign with the election campaign. Says Ajit Jha of the Socialist Forum in New Delhi, a member of the alliance, "The constituent groups were allowed to field candidates on their own, support parties keen on taking up their issues, organise public meetings, confront candidates and expose them if they resorted to eyewash or gave inconsistent answers." Some members like the Azadi Bachao Andolan organised public meetings in Uttar Pradesh to focus on Dunkel Draft issues and the danger of allowing multinationals to control national resources. Said the Andolan's Banwarilal Sharma, "We were late starters and not so well equipped to make an impact, but our meetings were well attended." Though NGOs propounded alternative development, they far too small to make an impact. The response of the environmental forum to the election process varied widely. In areas with a history of environmental protest, issues came into sharper focus than in places where they merited only cursory references: Tribal rights made an aggressive frontage in Madhya Pradesh. But some groups, like Chipko leaders in UP's Garhwal hills, stayed out of the election process. And, despite a conscious attempt in Rajasthan to fight mining from a political platform, it failed to make a dent in the election process. The election-bypass approach was prevalent in the Garhwal hills. Shishupal Singh Kanwar, a Gandhian, explained, "We do not rely on politicians to solve people's problems." The reason for this disdain is the inability of politicians to ensure regeneration of environment and to give the right to manage one's own resources. "We will work quietly in the villages to promote awareness," says Chakradutt Tiwari, a Gandhian worker in Chipko. Even women members of Chipko have turned apathetic because they feel their concerns for fuel and fodder do not draw support from local political leaders. Says Kanti Behn of a village near Gopeswar, "Collection of firewood takes so long that I do not have time even to cast my vote." In Rajasthan a coalition of NGOs organised a 950-km padyatra through the state to highlight the environmental degradation caused by mining in the Aravallis. Leaflets were distributed, public meetings were held and the people were exhorted to discuss local environmental problems with candidates. However, the padyatra went almost unnoticed in the "war of posters and blaring loudspeakers", as Harshvardhan of the Tourism and Wildlife Society put it. Jaipur-based activist Bhupendra Hooja is convinced "small and scattered NGOs are not well equipped to successfully influence the policy decisions of bureaucrats and politicians". In some instances, no matter how much support a party garners in its campaigns, voters ultimately are influenced by political realities. A pronounced assault from the environmental plank was launched in Chattisgarh district of Madhya Pradesh by the workers' and farmers' movement -- Chattisgarh Mukti Morcha (CMM), which fielded 25 candidates. In Durg district, CMM included environmental protection, occupational health and forest management in its agenda. The green politics earned them the support of tribals and workers in Dalli Rajhara and Dondy Lohara constituencies. In Kumhari and other nearby villages, the CMM is recognised for its staunch protest over the past four years against pollution of the Kharoon river caused by effluents from the Chhattisgarh distillery. Yet, in the pollution-hit villages, rustic pragmatism overtakes other considerations. Though they appreciate the CMM agenda and scorn at the promises of other parties, they still vote for a mainstream party. Says Akola sarpanch Durjan Lal Chakradhari, "Here, the whole village votes are for the Congress. He says there is no point in voting for the CMM because it will not form the government anyway. As for the Congress, its local candidate Danishwar Anantram Varma has only promised to end the pollution problem, Chakradhari said. The members of Gene Campaign, on the other hand, resorted to a different tack. They approached the Samajwadi Party, which adopted Gene Campaign as part of its election campaign. Yadav used this plank to woo farmers. According to Suman Sahay of Gene Campaign, "Yadav's aggression on the seed issue of Dunkel Draft forced the BJP to modify its stand on welcoming multinationals, which was announced by Jaswant Singh on the eve of elections. They now claim they will not accept farmer-related aspects of the Dunkel Draft." In the Capital, environment issues were stuck at local levels and failed to show up on a larger, city-wide scale (See box). Nonetheless, members of a ladies' welfare association who had an appointment with Congress candidate Jag Parvesh Chandra to discuss civic amenities and environmental issues were not allowed to meet him. Commented Saroj Vasishth of the association, "Few people bother about these things and the politicians know they cannot win or lose on these issues." Though the environment is making inroads into the political process, non-political observers do not see signs of green parties yet. Says Vinod Raina, "The time is not ripe yet for environment groups to participate directly in the political process as fragile alliances might undermine the environment movement, which is based primarily on trust and faith. It is more important to influence the political process from outside."